KYIV, Ukraine—I’ve experienced our country’s wars both as a combatant and a witness. 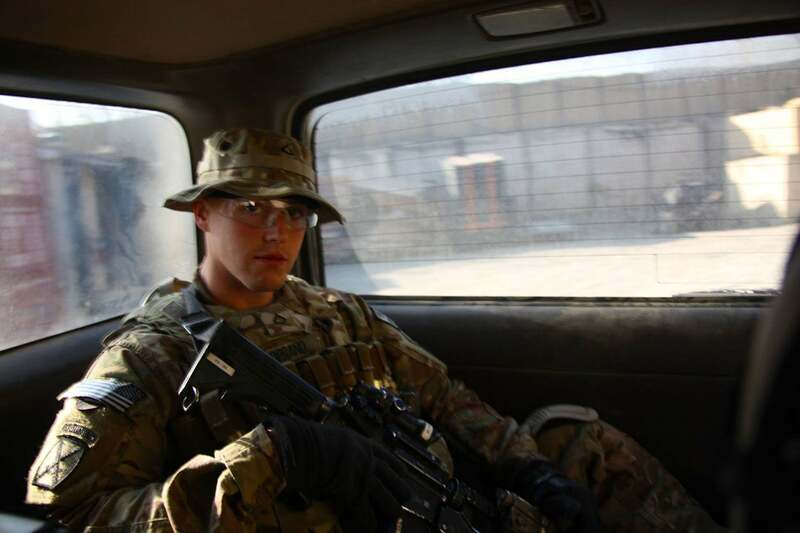 I deployed to Afghanistan and Iraq while I was an Air Force special operations pilot, and I’ve been back to report on both of those wars as a journalist. I’ve also reported on U.S. military operations at other places in the Middle East and across Eastern Europe. And this summer I visited the USS George H.W. Bush aircraft carrier off the coast of Syria, from which warplanes launched around the clock to wage the air war against the Islamic State terrorist group, also known as ISIS. Throughout my time on the front lines, both as a combatant and a journalist, I’ve heard a common, troubling refrain among America’s military personnel. Their general impression is that most people back home have either forgotten about or become apathetic to the fact that we still have soldiers deployed in combat zones around the world. This perception of indifference has entrenched an already growing divide between military and civilian societies in America. 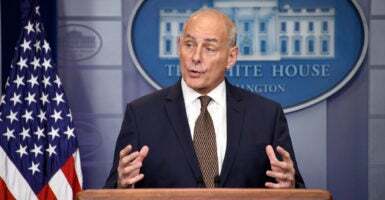 White House chief of staff John Kelly, a retired Marine general, evoked that sentiment during a solemn press conference last Thursday. Kelly’s right—even for those journalists who have been in combat. Because combat feels a lot different when you’re not just worried about your own life, or getting a good story. It’s a lot different when your actions decide the fate of your comrades in arms, as well as whether innocent civilians caught in harm’s way will live or die. The recent combat deaths of four U.S. Army Green Berets in Niger laid bare America’s entrenched civilian-military divide, as well as the contemporary reluctance of some media outlets to dutifully cover American combat operations unless there is a more “newsworthy” hook to the story. Some journalists have acted like the recent combat deaths in Niger illuminated some sort of shadow war going on. Then-President Barack Obama sent U.S. troops to Niger in 2013—and it was never a secret. It just didn’t make the headlines. The story disappeared, like many others related to our military’s combat missions, into the unending maelstrom of the modern news cycle. 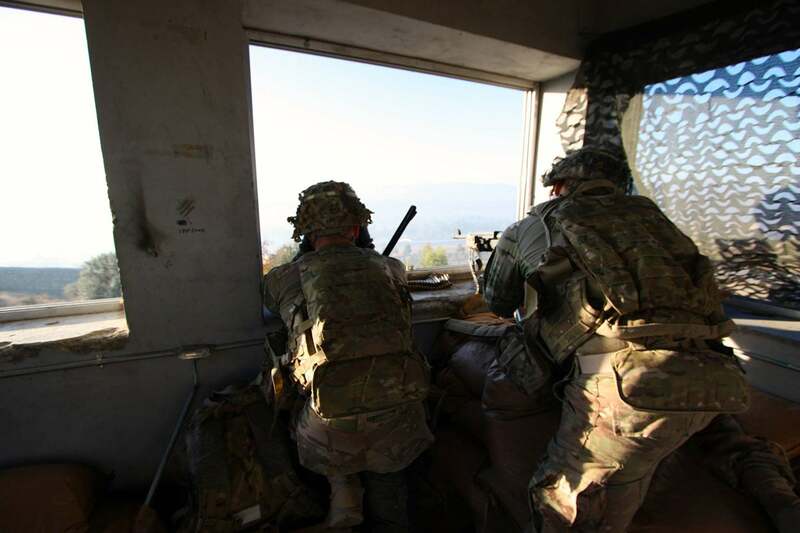 U.S. Army soldiers man a sniper position in Afghanistan in 2013. Media outlets that have their priorities straight should prioritize stories not by the amount of page views, likes, or retweets they generate, but by their ultimate importance to our civil discourse. Sadly, however, that’s not typically the case. It took the deaths of four Special Forces soldiers and a political feud to make U.S. military operations in Niger newsworthy. It shouldn’t be that way. But it is. Yet, call me naïve, but I still think my new profession is equally as important as my old one. Journalists, after all, have a unique and solemn duty to perform in a democratic republic that fields an all-volunteer military force. The limited participation of the American population in the armed forces, the physical remoteness of the battlefields, and the technological advances in war-fighting technology have made war largely an abstract burden to the overwhelming majority of Americans. Therefore, it’s the responsibility of journalists to make the cost of war real and relevant to people’s lives. We have to make war personal. We have to educate citizens about the costs of war to maintain societal hesitations to the application of deadly force. And we must hold our leaders to account by demanding that they thoughtfully and wisely make the case for war when it is just and necessary—without resorting to populism or warmongering. Educated citizens aren’t so easily hoodwinked into simplistic, reductive visions of the threats facing their nation, or the reasons for their misfortunes. That’s why good journalism matters. Operations aboard the USS George H.W. 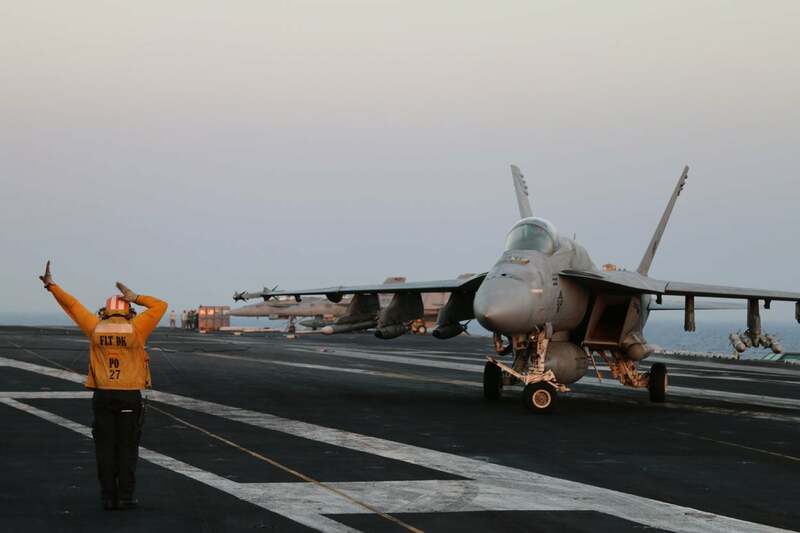 Bush to support the air war against the Islamic State over Syria. The volunteer fighting force represents less than 1 percent of the total U.S. population. Consequently, the trauma and sacrifice of combat is shouldered by only a small, select slice of our country. And only a small minority of Americans can truly relate to the experience of combat. Less than 8 percent of the U.S. population has ever served in the armed forces and only 1 in 5 members of the U.S. House and Senate is a veteran, compared with 3 out of every 4 in 1969. 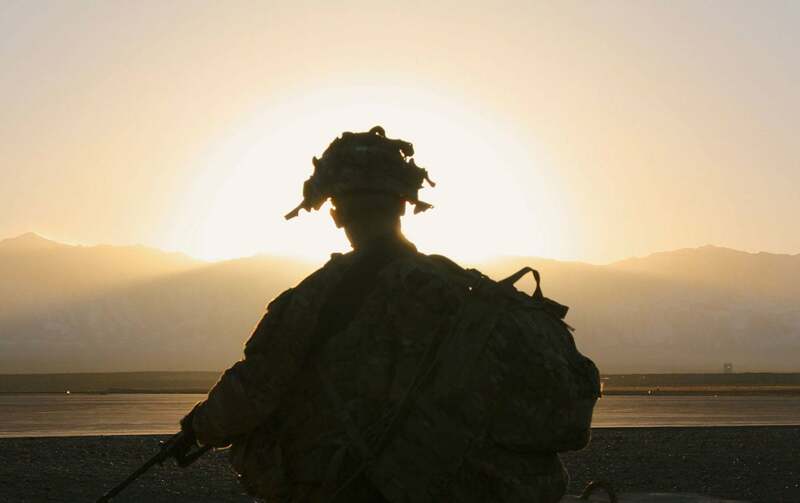 A U.S. Army soldier in Khost Province, Afghanistan. When the troops return we dutifully call them heroes. Some old vets might give them a handshake and a few candy bars when they step off the plane on their return. That’s how it was for me when I got back from my first combat deployment to Afghanistan. I arrived at Baltimore-Washington International Airport late at night. The arrival hall was almost empty, except for some janitors polishing the floor with an electric floor buffer, and a group of about two dozen Vietnam War veterans handing out paper bags filled with cookies and candy bars to those of us in military uniforms streaming out from baggage claim. The old man smiled at me, then patted me on the shoulder. And that was it. A week later, I was back at work preparing for my next deployment. 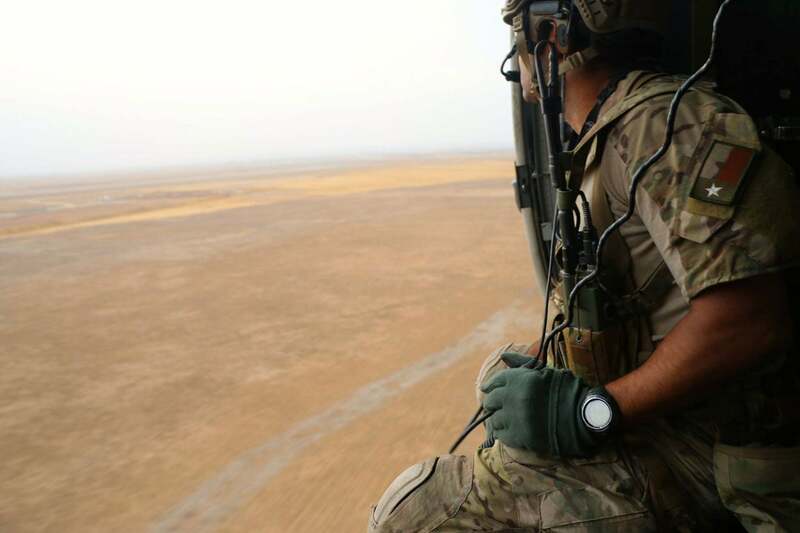 A U.S. Air Force pararescueman in northern Iraq in 2015. To be clear, the overwhelming majority of troops and veterans—myself included—don’t want special treatment, and they don’t want your praise. In fact, sometimes all the “thank you for your service” comments, while well intentioned, can make a soldier feel uncomfortable. Since, at the back of his or her mind are the constant memories of friends who made a much greater sacrifice, making us feel unworthy of the accolades. Still, the offers of thanks do send an important message—that the soldier, sailor, airman, or Marine hasn’t been forgotten. And that’s more important than anything else. All our troops and vets want is for people to pay attention. Many don’t really care what you say, or how you say it. They just want to feel like the country hasn’t forgotten about them, or their friends. They want to feel like their sacrifices were worth it. That the unrecoverable currency of their youths went toward a just and noble cause that, in the end, made our country and the world a little safer. 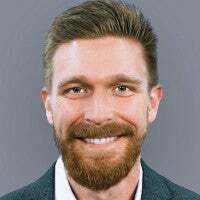 When I began a graduate journalism program at Northwestern University in 2011, just a couple months after I had left the Air Force, I couldn’t believe how unfamiliar many of my classmates were with military issues and the ongoing wars. One student asked me if I had “caught” post-traumatic stress disorder. Like it was the flu. Sixteen years after the Sept. 11, 2001, terror attacks, U.S. military forces are still deployed in Afghanistan. Some of my cohort couldn’t even locate Iraq or Afghanistan on a map. And these were graduate students at one of the most prestigious journalism programs in the country—they were the cream of the crop. I entered the military when I was 18 years old to attend the Air Force Academy. So my time at Northwestern University as a 29-year-old was basically my first taste of civilian life as an adult. 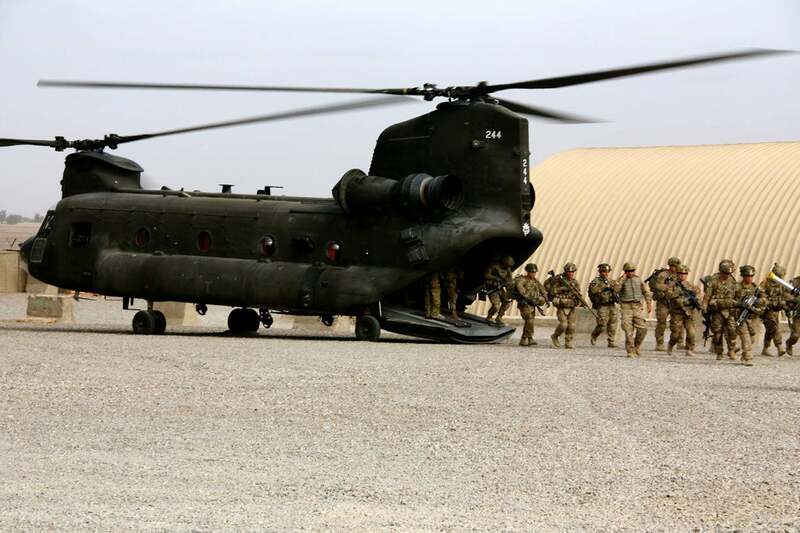 Once out of the bubble of military life, I was shocked to learn how the wars in Iraq and Afghanistan, which had consumed a decade of my life, had been practically forgotten by the rest of the country. In some ways, returning to civilian life felt like walking alone in a foreign country. And that feeling hit a tipping point for me when my little brother, Drew Peterson, who was an Air Force captain at the time, deployed to Afghanistan in 2013. 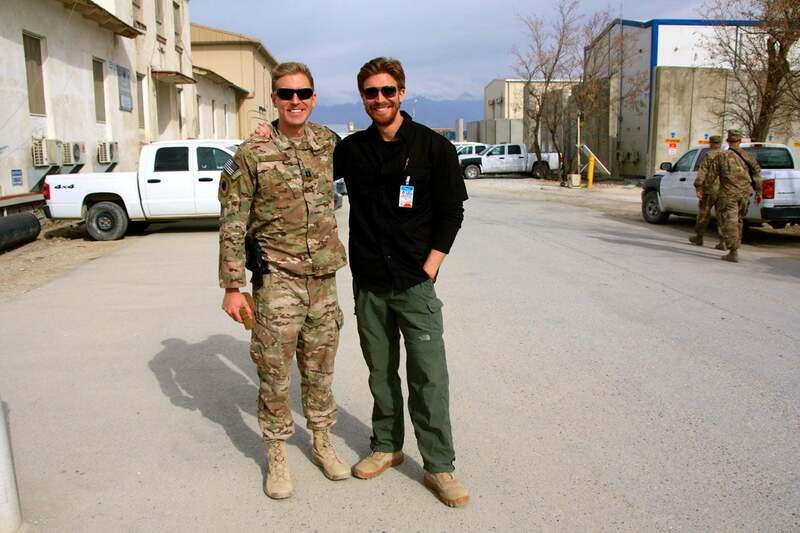 The author, right, with his brother, Drew Peterson, together in Afghanistan in 2013. In September 2015 I visited a U.S. Air Force A-10 “Warthog” attack squadron stationed at an undisclosed location in the Middle East. Unexpectedly, I ran into two old friends of mine. I had gone through pilot training with them in Columbus, Mississippi, way back in 2007 when I was an Air Force lieutenant. Many U.S. soldiers have never served in peacetime. In Afghanistan they had maintained a defensive mindset, they told me. The priority in that war was to defend U.S. troops on the ground with close air support. But in the air war against the Islamic State over Iraq and Syria, the pilots described their mindset as offensive. In addition to close air support and bombing missions, the A-10 pilots also flew air interdiction missions in which they patrolled for targets of opportunity—essentially they went out looking for Islamic State militants to kill. And they killed a lot. 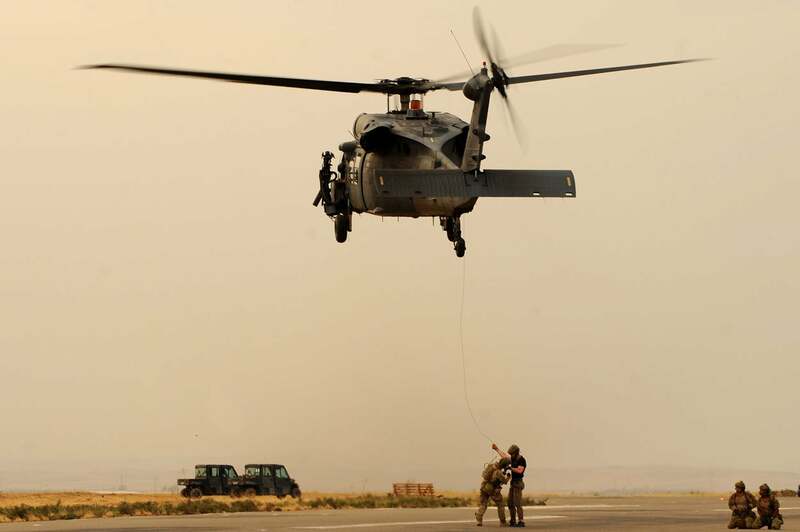 Sometimes one pilot would kill dozens of Islamic State militants in a single mission. Often, by strafing the fleeing enemy with the A-10’s 30 mm Gatling cannon. What struck me the most as I talked with my old friends in that desert chow hall was how casually and humbly they talked about the killing they did. They interwove stories about wives and children back home with macabre stories about the war. The pilots’ eyes seem to focus on mine a half-beat longer than normal as they matter-of-factly described strafing an enemy checkpoint, or killing Islamic State fighters one by one as they attempted escape. Sometimes, the pilot would lean back in his chair with eyes open wide, slowly shaking his head as he described the carnage he inflicted on the enemy. But there was no remorse, not even the hint of it. And there was no questioning the justice of the war. The barbarity of Islamic State had reinvigorated the sense of mission for many deployed troops, who might have been dismayed by the hamster wheel wars we had been fighting in Iraq and Afghanistan. 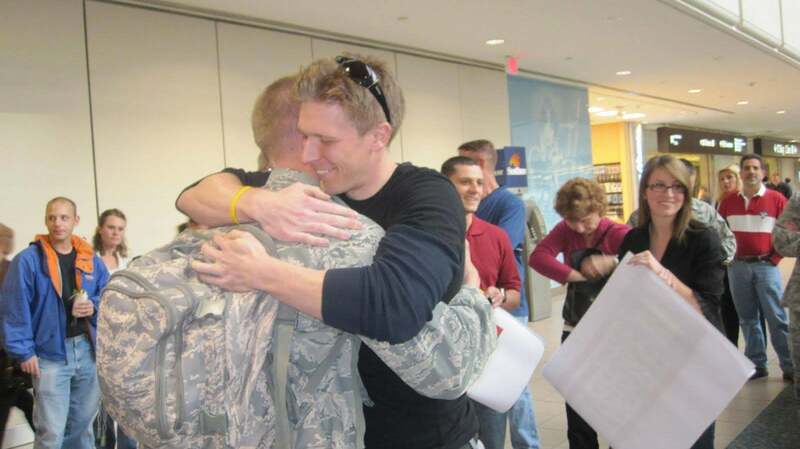 The author, right, greets his brother upon returning home from Afghanistan. The Islamic State’s snuff videos gave their mission a special sense of justice and urgency, which we had all felt in those early years after 9/11, but somehow lost over time. That same mindset echoed in the attitudes of many other U.S. servicemen and women I’ve met in the intervening years. Our troops might not necessarily believe that the wars will be won anytime soon, but they all seemed to believe in what they were fighting for. And, although those A-10 pilots had absolute faith in the justice of their cause, they also suspected people back home didn’t understand the seriousness of the threats that face our nation, as well as the scale and ferocity of our military’s unending operations to keep those threats at bay. In February 2015, I joined a U.S. Army Stryker convoy as it traveled 1,100 miles from Estonia, down through Latvia, Lithuania, Poland, and into the Czech Republic. The convoy was called Operation Dragoon Ride; it was meant to show U.S. resolve to defend NATO’s eastern members from Russian aggression. 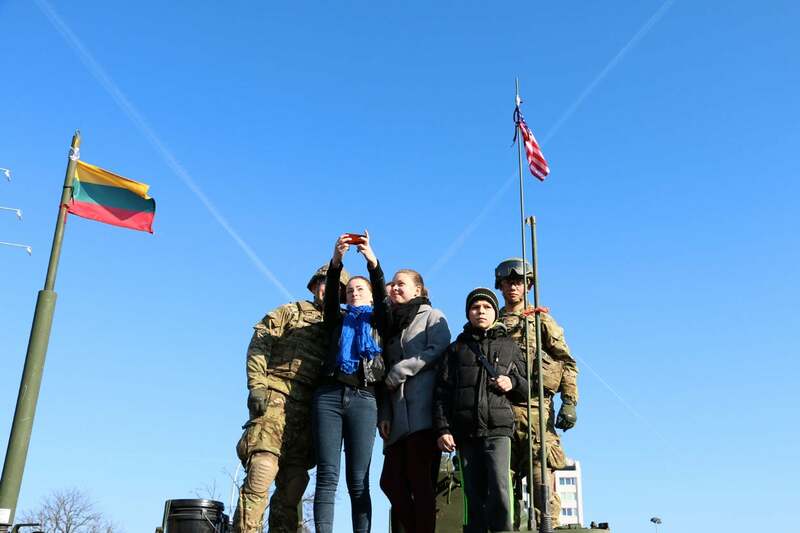 Citizens of NATO’s Baltic countries warmly greeted U.S. soldiers during Operation Dragoon Ride in 2015. Along the way, thousands of people lined the roadside waving U.S. flags. Fathers had children on their shoulders. Young women blew kisses to the U.S. troops. At each stop, no matter how small the village, hundreds of people gathered to meet the soldiers and get selfies with them. I wish you could have seen it; it would have made you proud to be an American. Maintaining a dominant military with a global presence is not just about national defense or international stability. Our military is also the torchbearer for our country’s values, and a beacon of hope for people fighting for their freedom around the world. That’s what our men and women in uniform fight for. That’s what they’re willing to die for. It shouldn’t take a tragedy or a political feud to remind us of that.